When you are out for camping, hiking and mountaineering, the biggest challenge is to have healthy food and keep your body energetic. People normally carry packed and dehydrated food with them. If you are tired eating the same tasteless food and want to have some homely taste you need to carry some cookware with you and cook delicious food yourself. But you don’t want to carry heavy cookware in your backpack. 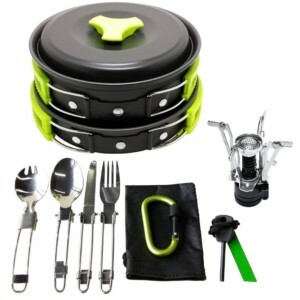 Then this 17 Piece Camping Cookware Mess Kit Bug Out Bag is your perfect companion. 17 Piece Camping Cookware Mess Kit Bug Out Bag is a perfect kit with all required utensils in one compact kit. 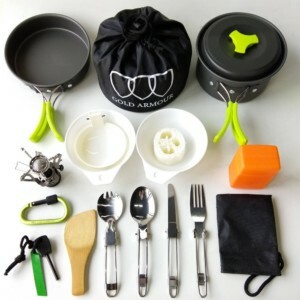 Folding Stainless Steel Sport, Spoon, Fork, Knife , Mini Stove with PIEZO ignition, Anodized Aluminum Nonstick Pot as well as Nonstick Frying Pan, Pan Cover, 2 BPA Free Bowls, BPA Free Soup Spoon, Rice Ladle, Loofah Sponge, Carabine, Fire Starter and Nylon Bag; there can never be a better cookware set. Product is available in multiple colors including GREEN, ORANGE, BLACK and BLUE. It is compactly designed with lightweight and easy to carry. The foldable design also makes it easy to clean and carry. Being made with the highest quality FDA approved anodized aluminum pot and frying pan makes it non-stick. For this reason, the product is highly durable. The product comes in fairly cheap pricing compared to the value addition it provides. It also boasts 100% Satisfaction Guaranteed with 10 Year Warranty. The Gold Armour will take care of any product issues and service issues and is committed to delivering the best experience for all buyers. · Very compact, light weight, well put together and easy to carry design. Pots are Teflon coated and the kit comes with a wooden spoon and a plastic ladle so it won’t get scratched. · Requires some balance for the pan because the head on the stove is pretty small. In essence 17 Piece Camping Cookware Mess Kit is a great product when comparing it’s pros and cons. It’s especially a great product to gift your loved ones, friends and families as it seamlessly blends elegance and functionality.